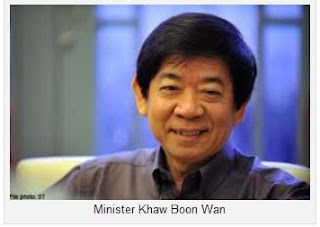 During the Parliament debate on the population white paper, Minister for National Development Khaw Boon Wan said that restricting the growth of the foreign worker population would “throw a spanner” into the HDB’s plans. “To complete the ramped-up construction programme, I do need more construction workers, more than currently available. That is why I was shocked by WP’s recommendation yesterday: That we freeze the foreign- worker population, immediately and for eight years,” said Mr Khaw. Barely a few weeks ago, Mr Khaw highlighted the efficiency of Australian construction firms which have adopted new technologies. “The Forte, a 10-storey residential development in Melbourne, was completed in 11 months instead of 14 months with only 4 workers, 2 crane crews and 1 supervisor on-site,” wrote Mr Khaw. Mr Khaw himself recognises the potential for technology to be employed to increase productivity in the construction sector. The examples of Japan, Australia and Hong Kong indicate that it is not impossible to attract locals into a high-skilled, highly-productive and highly-paid sector. Doubts have also been raised about the poor quality of HDB flats, which have been constructed by unskilled foreign labourers. Styrofoam boxes stuffed in ceilings and numerous cases of cracked tiles in new flats are among examples of shoddy workmanship. While Singaporeans certainly have foreign labourers to thank for building our infrastructure and our flats, it is to be expected that unskilled labourers may not be well trained or supervised, and thus can make costly and potentially dangerous mistakes. Rather than hiring entire villages’ worth of unskilled labourers, we could have managed with merely 6 highly-skilled Singaporeans for a 10-storey apartment block. This would have the effect of raising the wages of Singaporeans, reducing unemployment and reducing overcrowding due to overpopulation. Ministers in Singapore are the most well-paid in the world, and should be the most talented. If Mr Khaw cannot even build 200,000 good quality flats with mainly local high-skilled labour, which is not an impossible task given the experiences of other developed countries, then perhaps he should resign and allow a capable person to take on the job.